Turnover in the news department of REN TV, Russia's last nationwide television network with independent news programming, has raised questions among analysts and media watchers about Kremlin influence in the channel's sale and the role of RTL Group, the broadcasting arm of the German media conglomerate Bertelsmann. Romanova and the colleagues who followed her in leaving the station said that REN TV's German investors have been a particular disappointment, saying they had expected the outsiders would be protectors of freedom of the press. Recently one of Germany's larger media firms announced that it planned to purchase a majority stake in ProSiebenSat1, Germany's second largest broadcasting corporation. So what? No big deal, just another corporate merger, right...? Wrong. This isn't just any media firm: It's Axel Springer. And Axel Springer is the sort of company that touches a very raw nerve with certain groups of Germans. For starters, it is a firm that values a strong transatlantic partnership, supports the Israeli peoples' right to existence and is dedicated to fighting totalitarianism. But that is just the half of it. The firm, which owns newspapers like "Die Welt" and the best-selling tabloid "Bild," is also perceived as conservative. And to top it all off, the Chairman of Axel Springer is one Mathias Doepfner, a man who has mercilessly criticized the resurgent anti-American, anti-capitalist, pro-appeasement tendencies in German society. So when Springer announced it wanted to expand its reach, a shrill cry went up from the ranks of the German left that democracy itself was being threatened by over-concentration of media. Particularly loud, fearful objections were registered at Stern and Der SPIEGEL. The SPD's Vice-Chairman for its parliamentary fraction, Ludwig Stiegler commented openly that, "This is a very alarming concentration of media power in a conservative publishing house." Stiegler added, "Springer shouldn't celebrate too soon. I am certain that the anti-trust authorities will take a very close look at the merger." As is so often the case, the outcry was a highly selective one motivated in part by personal interests and political fears. Remember that Stern is Germany's most widely read weekly with 8 million readers and Der SPIEGEL is more or less tied for second-place with FOCUS with around 5 million. And it just so happens that Bertelsmann, far and away Germany's largest and most powerful media corporation (and Axel Springer's major competitor), owns a majority share in Stern and a 25.5% stake in Der SPIEGEL through its subsidiary Gruner & Jahr. And let's just compare Germany's two largest media firms for a moment: Bertelsmann has a turnover of 17 billion Euros, a presence in 63 nations and a workforce of over 76,000 employees. Axel Springer has a turnover of 2.5 billion Euros, a presence in 27 countries and a workforce of 10,700. Should its merger succeed, Springer would still be much smaller than Bertelsmann. Yet we are supposed to be worried about the over-concentration of media power at Axel Springer? Is there something wrong with this picture? The Wall Street Journal: "Axel Springer's Enemies"
"German democracy is under attack. At least that is what a flock of the media elite has been claiming since Axel Springer, Germany's largest newspaper publisher, said Friday it would buy ProSiebenSat.1, the country's second-largest broadcasting group. This "cannot be in the interest of democracy," said Michael Konken, the chairman of Germany's journalist association. Frank Werneke, a trade union leader, called for "the containment of media power across sectors." These concerns would sound more sincere if they also had been voiced four years ago when Bertelsmann, the world's fourth-largest media company, took control of RTL Group, Germany's largest broadcaster. But back then, there were no such warnings about democracy's imminent decline. Bertelsmann's outlets are more to the liking of the German left. The principles Springer journalists are expected to support are freedom and democracy in Germany and efforts to bring the peoples of Europe closer together; reconciliation between Jews and Germans, which includes support for Israel's right to exist; the trans-Atlantic alliance and the liberal value community with the U.S.; the rejection of totalitarianism and the defense of Germany's free, social-market economy. What sounds like a manifesto that any reasonable democrat in Germany should be able to sign is now being called a threat to the country's democracy. Without doubt, the company's commitment to the trans-Atlantic relationship is what irks its opponents the most. Springer publications often criticize U.S. policies but its readers will not find the kind of hysterical anti-Americanism now so prevalent in much of Germany's media. Consider the two weeklies Stern and Der Spiegel, both with circulations of over a million and links to Bertelsmann. 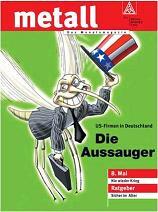 Der Spiegel in particular is considered Germany's most high-brow and influential political magazine. To give a flavor of the kind of image these two publications spread of the U.S. and the Bush administration, one only has to look at some of their covers. 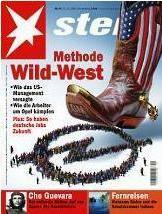 Last fall, when General Motors was considering layoffs at its German Opel unit (which in the end did not happen), Stern's front page showed a giant cowboy boot with the American flag on it about to step on a group of people grouped together to form the Opel logo. The headline was "The Wild-West Method." Another front page in March 2004 showed President George W. Bush in front of an American flag above what looks like a Middle Eastern city from which smoke is rising up. Headline: "How America lied to the world." The story was about the Iraq war, of course. Before the U.S. election last November, Der Spiegel showed a caricature of President Bush dressed as a cowboy ready to shoot his opponent. The headline here was "Will America become democratic again?" Another front page in 2003 showed the American flag with little assault rifles and gas nozzles superimposed on the stars, headlined "Blood for oil. What Iraq is really about." Television, particularly public broadcasters ARD and ZDF, whose news shows are still the most trusted, often echoes such themes. According to Media-Tenor, a media analysis center headquartered in Bonn, their Iraq coverage was at times even more negative than that of al-Jazeera. Rather than stifling the political debate, Springer's expansion to the TV world is likely to introduce the kind of "plurality of opinions" its opponents claim he threatens. What Springer threatens is not the diversity of view but the uniformity of view and group think -- and that can only be healthy for Germany's democracy." Day for day we at Davids Medienkritik point out examples of anti-Americanism in the German media. We report these examples because we know, through our own experience and observation, that they are part of a larger trend that is seriously damaging transatlantic relations. Many of our strongest critics, however, suggest that the examples we present simply represent isolated incidents in the German media and that our postings are little more than anecdotal. They deny that anti-Americanism is widespread in the German media and claim that German media sources are fair and balanced. Unfortunately, such critics are often very short on convincing evidence. Just two days ago, an independent German media research institute, Medien Tenor, released the results of a major, long-term study on seven major German television news programs that examined over 14,000 individual television news reports. The results overwhelmingly confirm what Davids Medienkritik has argued all along: That Germany's largest, most influential media outlets are pervasively biased against the United States. Despite the short-term positive reporting of the Bush visit at the end of February, the negative trend in the portrayal of US-American protagonists and institutions that has been ongoing since 2002 continues in German television. This is shown by a current, long-term analysis done by the independent Bonn media research institute Medien Tenor of the main news programs of ARD, ZDF, RTL, SAT1 and PRO7. "Since the German federal government backed away from its 'unconditional solidarity' in the year 2002, the rating has gone continually downwards in the television news," explains Roland Schatz, the Director of Medien Tenor. The short "Bush-Schroeder pageant" in Mainz also did not bring a sustained change to the news reporting. The negative trend was also not limited to political figures, but also encompassed news reporting on business. Scandals and crises have predominantly marked the picture of the American economy since 2002. "Successful developments clearly stand in the shadow of scandals and are barely portrayed," Schatz analyzes. The news prefer to repeatedly present their viewers with information on Enron or the investigations of Eliot Spitzer instead of reporting on success stories like those of Dell. For the analysis, Medien Tenor evaluated 14,703 news reports in seven German TV news programs. ARD Tagesschau and Tagesthemen, ZDF heute and heute journal, RTL Aktuell, SAT1 NEWS (18:30), Pro7 NEWSTIME. Time period: January 1, 2002 to March 31, 2005. The results of this study also emphatically contradict the claim that German media are simply "anti-Bush" and not "anti-American." The study clearly shows that major German television news programs suffer from a pervasive, across-the-board bias against the United States in reporting on both political and non-political matters. Bearing these results in mind, is it any wonder that the United States has grown less popular in the eyes of the German people? How would the American people view Germany if they were bombarded daily with increasingly negative television images of German society, politics, culture and business? When will the leaders of both nations properly recognize this issue and the impact it is having? Finally, as a concerned observer, one has to wonder how the German government could possibly be taking out expensive, full-page color ads in American newspapers claiming that Germany and America are "united" and "partners" while failing, completely, to criticize the media bias in their own country that is slowly destroying German-American friendship. Why, for example, has Gerhard Schroeder's so-called "Coordinator for German-American Cooperation" Karsten Voigt been so deafeningly silent on this vital matter? Could it be that Gerhard Schroeder and his Socialist-Green coalition know that they may, again, have to rely on anti-American media and voters to put them into office come election time, as they did in 2002?